In his submission to the Constitution Commission, Professor Wadan Narsey zeroes in on how coups have been a 'lose lose game' for both Indo Fijians and Itaukei. 1. The two most important indicators of well-being are employment and income figures. The latest figures may be obtained from the Fiji Bureau of Statistics whose 2010-11 Employment and Unemployment Survey data are still being finalised, although preliminary estimates may be requested by the Commission from the FBS. 2. The available data on employment indicates that while the total number of economically active persons has increased between 2006 and 2011 by around 20%, the number of wage earners has changed little or may have even declined. This is to be expected given that there has been very little economic growth between the two years. Salary earners may have increased slightly in the public sector, because of increased spending by government and statutory organisations. 3. The data on incomes would suggest that real incomes of the unorganized sector may have decreased by up to 30% given that there has been virtually no increase in nominal wages while inflation as measured by the CPI has been around 36%. Given that food prices have risen in the same period by 48% and the poor generally spend more of their income on food, their cost of living between December 2006 and July 2012 has risen by probably above 40%. It is therefore a conservative estimate to suggest that the most vulnerable workers in Fiji (who are usually covered by Wages Councils) have seen a reduction in their real incomes by more than 30%. 4. It is pretty axiomatic that rates of poverty have increased since 2008-09 when the last HIES was conducted. The aggregate incidence of poverty in 2008-09 was 31% (18% in urban areas and 43% in rural areas). In both areas, the incidence of poverty is likely to have increased significantly, because of economic stagnation in urban areas and continuing economic decline in rural areas. 5. The military coups of 2006 and 2009 may be held partly responsible for the overall decline. The decline in rural sugar areas is largely due to the continued decline in the sugar industry, with a major cause being the withholding of $300 millions of EU aid originally allocated for industry reform, because of the Regime's refusal to hold elections in 2009, but also the reduction in canefarmer margins because of reducing EU prices, and rising costs of cultivation, pesticides, fertilizers, harvesting and transport. Many of the cane farmers also have reduced their commitment to cane farming because of greater financial security through grown-up children. 6. Other areas of rural decline, may be attributed to the inability of successive governments (not just the Bainimarama Regime) to establish appropriate marketing mechanisms for rural crops, with the result that farmers have been demoralised by a cycle of gluts and depressed prices and have reduced production of a large array of crops. Other factors have been lack of agricultural extension support and widespread theft of crops. 7. In urban areas, poverty has increased because the Regime has for five years been giving in to powerful employer lobby groups, who have managed to get postponements of Wages Councils Orders, with not a single employer showing accounts to either the former Wages Council Chairman (Father Kevin Barr) or the Labour Minister. Father Barr has since resigned. 8. Another aspect where the Regime's policy has directly had a detrimental impact is income distribution. In difficult times, while one might expect a government to ensure that the better off take a relatively higher share of the burden of generating revenues for government, the Bainimarama Regime has done the opposite. In the 2012 Budget, the Regime reduce corporate tax AND taxes at the higher levels, from around 30% to around 20%, immediately handing over some $30 millions extra to each group. 9. Simultaneously for the same year, the employers' associations were fighting tooth and nail to deny Father Barr's Wages Council increases, which might have cost them around five to ten millions. 10. There is little doubt that income distribution has worsened significantly under the Regime's stewardship, in large measure due to their own policy measures. 11. It is no surprise that the corporate sector in Fiji has been delighted with the Bainimarama Regime as there has been no government since independence, which has served the employers and corporate sector so well in taxation laws. 12. It is no surprise that the corporate sector have made no public calls on the Bainimarama Regime to be accountable to the public with the Auditor General's Reports, or to remove all media censorship and the draconian labour laws. 13. While existing investors have been well-served by the Regime, overall however, the increase in poverty must be attributed to the failure of the economy to grow, which is ultimately due to the lack of new private sector investment. Total investment as a proportion of GDP has needed to be around 25%; in reality it has hovered between 12% and 18%, and the latter high figure is due entirely to increasing public sector investment. 14. In large measure the failure of investment may be attributed entirely to the lack of investor confidence in political stability, caused by the military coups of 2006 and 2009, and associated decrees which have broken the sanctity of contracts. These have not only hurt groups such as pensioners (whose pensions were reduced fro 15% to 9%, but whose case alreadu before the courts, was thrown out by decree. There have also been cases, such as at the Nadi Airport, where existing leases of tenants have been arbitrarily cancelled, while property of tourism investors at Momi and Natadola have been appropriated by the Regime, with a banning of any recourse to courts. Such actions seriously undermine investor confidence. 15. It should be pointed out that one cause of political instability has been the tendency of race-based political parties, when in power, to focus primarily on their own ethnic group as in need of "affirmative action". 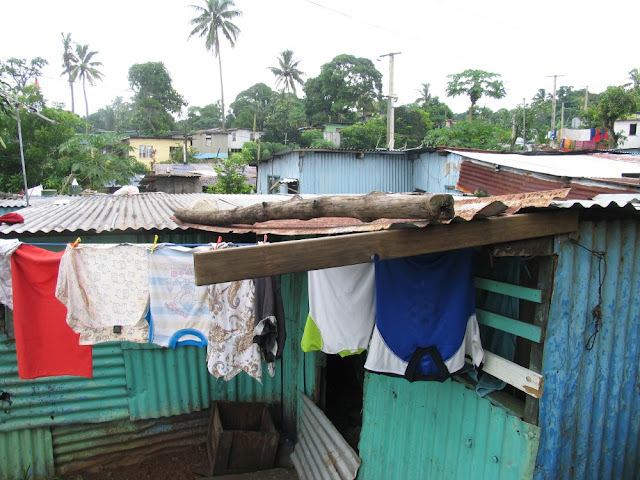 The two major parties have been reluctant to accept the objective assessment of poverty in Fiji which clearly shows that the two major ethnic groups are equally poor and assisting the poor on the basic of need alone, would distribute poverty alleviation resources roughly in proportion to their population numbers. Numerous of my publications have attempted to show that, the latest being my poverty report based on the 2008-09 HIES. 16. It also has been a futile exercise pointing out to many political leaders that if the economy grows well because of political stability, then the cake available to government expands enough to satisfy everyone's affirmative action policies, even if ethnically based. If however, the cake does not grow, or shrink as has often been the case, then no one's affirmative action policy can be funded from tax payers' funds. 17. The submission recommends that the Commission emphasize in their report the terribly damaging impact that military coups have had on Fiji's incomes, standards of living, and poverty, and that far from being a "zero sum game", coups have been "lose-lose games for both the major ethnic groups. 18. Currently, it may be noted that there is a slight upward trend in buildings approvals, with the very real prospect of normalcy returning with elections in 2014. Investment is picking up slowly, but full recovery is largely predicated on elections being held and a government, accountable to parliament, being put in place. 19. One area rarely discussed publicly is that there has been a significant real decline in property prices between 2006 and 2011, while the pre-2006 coup trend was a very strong positive one. One major impact of this is the reduction of foreign capital inflows into the country. 20. The submission recommends the Commission obtain the views of real estate agents on the impact of the 2006 and 2009 coups on property prices and inflows of foreign capital. 21. It may be pointed out that there has also been an extremely large increase in public debt, with debt repayments rising to record percentages of total government revenue This public debt will have to be paid by the future generations. It is unfortunate, however, that part of the problem of lack of accountability of this Regime is a total refusal to report to the public on the amount of foreign loans that have been incurred by this Regime on tax-payers' behalf, the interest costs, and the repayment terms. 22. This submission recommends that the Commission obtain from Planning Office the statistics on the last ten years' of debt repayments (capital and interest) in absolute amounts and in relation to government revenue, and in relation to GDP, project also five years into the future. It's really simple, there is no accountability under a dictatorship. oe mark u seem to know alot bout wat goes on in my paradise....the thing is mark...i have never heard of u and not see u done anything for the betterment of my country and its people...unless im wrong mark...but me thinks ur just another waste of fresh air cloggin up our thoughts of wat is gud and not good for my beloved fiji...its easy for u to say alot about wat goes on here at home mate!...u dont even leave here ..or belong here for tht matter..sa kua so na somi sisi!...let us fijians decide wat is good for us...not some wannabe who thinks his opinions matter..coz wat u say or entitled to say does not matter in anyway shape or form!..let us fijians decide wat is good for us fijians! @anon 12:35 I totally concur with you. Its like me, a foreigner in Oz trying to dissect and commentate on Australian politics. I assume Aussie mark thinks Oz politicians are perfect. Yeah right, Peter Slipper comes to mind and so does Gordon Nuttall - currently in jail for corruption. We don't need no more meddling neo-colonialists who want to patronise us with their big brother knows best attitude. Mark, stick to hynotherapy mate. The heading of your blog talks about media freedom so publish this if you stand for just that. then again who knows mark might just be getting sumthing out of all this?? ?maybe a free holiday to my paradise?? ?..it seems mark manning knows alot ..its a big difference in doing alot mark!...so why dont u come over to fiji and maybe submit to the commision ur ideas and views of wat u think is gud enuff for us fijians...ooppss..then again i just realised its only for fijians ...sorry mark it doesnt matter dude..thanks for standing up for wat u think is right..but as long as u keep blabbering from the land down under then u will just be blowing in the wind!...im sure u love my fiji and im sure its not as much as we love our own country!.. Dr Narsey seems to be hitting the nail on the head all the time, no wonder the Regime hates him so much. Thank you again Dr Narsey for highlighting the weaknesses of the current Regime, despite their articulate propaganda, you have always exposed their true worth. You sound like an impostor pretending to be an uneducated Fijian. all the hallmarks of a pretend journalist who is too scared to attend Sydney's Fiji's Democracy and Freedom Movement annual General Meeting, I'm not mentioning any names, just putting it out there! Not very convincing or imaginative Graham. Unbelievable! !…this high and mighty Fijian academic; his royal eminence Professor Wadan Narsey's lives up in the sky of outdated text books and unrealistic statistics. First he proposes to our young innocent Fiji children to emulate the cunningness, bigotry, anti Semitic and alleged racist murder of Black South Africans, the late Sergeant Major Mohandas Ghandi. Now he wants all to belive that Fiji is a starving Nation..Goodness..does he ever get off his car at all ! !..or is he only jumping at the cheering of a few Union leaders and other pretent Fiji patrioits! …streets translation....”goodness, we though the Fiji poverty portrayed by the world press fed by some goose jorno in Fiji regress you guys in Fiji to rib exposed bag of bones seen in some famine stricken deserts of Africa”!! Oh…he did not mention that the dual Citizenship provision has energised former Fiji residents to invest in Fiji, relocate some of their operations in Fiji, buy property in Fiji, send their children to school in Fiji, increase marriages in Fiji, holidays and even BURY their dead in Fij!! Dur…realistically, very few non Fijian foreign investors will, for now, ever come to Fiji way to invest…that is the reason the mobilisation Fijian Diaspora Investors are coming in droves! !..yours trully is assisting set up at least 2 mega multi milions $ Produce Factory in Deuba and Bottling plant in Taveuni.. He better call..former military Dictator Masaruf of Pakistan for a lesson on this very simple phenomena of economic resurgence and revival by the Diaspora who still have their hearts and pockets turned towards home, beloved Fiji!! …one does not need to be an economic guru to kapis…even I, a humble grand dad know about it..
..or are we to believe only those who have pre and suffix to their honorable names..! The whole Police, Army, and Corrections services in Fiji are corrupt and the Government. Burn them all. With unblinkered and realistic views like yours they suggest that all is not as bad as some try to portray. Semi take your medication because you're rambling on again. Anon..October 17, 2012 4:20 PM..indeed my friend..
No doubt, every day...every day. Fiji prays that the good Lord "make a way in the wilderness" of this mingled Coup culture .."a cool energising riverflow in the desert " of our dryness to respect and love one another…. Every prophetic prophecies during the “veqaravi vakavanua”…me cabe na ika mai takali..…vuavua i vinaka na i tei kei na vuata..lailai na dawai e na koro..vaka na matani nuku na nomudou kawa…phew…every single day!! If we do believe these prophetic words….”as life and death in in the power of the tongue” , then why be unnecessarily be alarmed when other ill informed prophets of doom prophesies otherwise?? Oh….to October 17, 2012 4:47 PM..of course I took my medicine to keep me immune to the stincking spews and filth of some cowards in this cyber boxing ring! Mark...why the assumption tht everyone who post views that is not in line with urs ..is graham?? [by the way never heard of this graham as well..can u explain to me who he is? ]...but u got it rite there mark...im a fijian..[not an imposter like u pretending to fight for us fijians..we can fight our own battles ]..neither am i pretending to be a journalist..thats the last thing i want to be bruv..and i dont pretend to be something im not [like u]..i may not be as educated as u or many of u for tht matter..but neither am i gullible..into beliving tht u actually are fighting for the fijian corner without something to gain for urself..coz bruv im a fijian and i will fight tooth and nail for the betterment of my beloved country..to the death if thts wat it takes...so enough of ur assumptions coz we both know its the mother of all fuckups..and u talk bout fear in coming to sydney..cmon bruv if ur balls were as big ur mouth u would be here in fiji..where it really matters and where all the action is..that goes for ur masters u serve with passion as well..tht meeting they having there in sydney?? ?will it amount to anything where we the ordinary fijians get to see with our own eyes the diference it makes? ?...the thing is mark..like ur masters u guys dont have the balls to come home here and stand up for wat u think is right..too much talk..but nuthing gained..u seem to say alot of negative things bout things tht go on in my country...a country where u dont ven live in or belong too for tht matter..thst all im trying to say here mark..thanks for ur help and ur offer of help..but this is fiji..best left to fijians to sort things out for themselves..coz when the curtain falls at the end of the drama..we got to live amongst ourselfs with wat we decide...belive u me we dont need some scumbag who has done nuthing for his country to come and try and influence things in some next mans land..and as for ur comments for not being imaginative ..i dont need to be imaginative when im speaking the truth[is tht wat u do when u speak the truth..imagine..]if thts wat u do mark..then kindly imagine tht this is not ur country[shouldnt be hard] and try to convince urself tht wat u say or do doesnt matter and its time to imagine u leaving us fijians to deal with our own...thats all mark!...as for the journalist well mate i personally think they are the scum of this earth..but thts just me making an uneducated assumption...there u go mark<<>>>>>>>>><<<<<<<<<<<<<<<<<ur move matavaka demu! Mark, Graham often posts to C4.5 anonymously -- we all know that -- but Anonymous 12:35 doesn't sound like Graham. He's not as snide or full of himself. Semi Meo, why don't you contribute your views to Grubsheet Feejee, so nobody would have to read them? Fijians will fight tooth and nail for the betterment of our beloved country? Fiji is where all the action is? No bati. Just talk. Nothing but empty talk. ..faceless and nameless cyber thug of October 18, 2012 10:53 AM...soooo...what's your point?? ..better get Davies to pray for you..he is a late Qaselevu son, you know! Another piece of academic script for wadan's list of articles- reality counts not photos of slums. Slumps are in all countries and even in so called developed countries!!! Semi Meo, my point is that your rumblings are mostly nonsensical, uninteresting, illiterate and pointless. In your case, incoherence is a blessing, because whenever you do come close to making a point, it's usually treasonous in nature. Grubsheet Feejee is the appropriate place for treasonous nonsense. Semi Meo you dumbass. Please explain what these words mean, and they're from your posting above. Releaved, fo evr, granddfathers, excepeted. Hahahaha you are indeed one dumb man. Go back to school and learn. Anon..October 19, 2012 4:53 PM...who cares how we spell or cast a spell in this cyber sphere?....as if you care to spell your name correctly…opps…your dad’s surname is Anon too? ?...no wonder…no wonder…same DNA of cowards……uh...to use your lingo....uh.."dumbass"